Note: This is a crosspost, which was originally published at VirginiaCopBlock.org, about the tragic and untimely death of James “Jimmy” Higgins, a longtime member of Virginia Cop Block. Toward the bottom, there is information for a vigil being held in his honor, which is scheduled for March 23. In addition, there is also a link to an online fundraiser campaign to benefit Jimmy’s family and help defray the cost of his funeral and memorial services. Those of us here at CopBlock.org would very much encourage and appreciate any donations that you are able to provide to them. I sit here typing this, still in disbelief, completely shocked and deeply saddened. 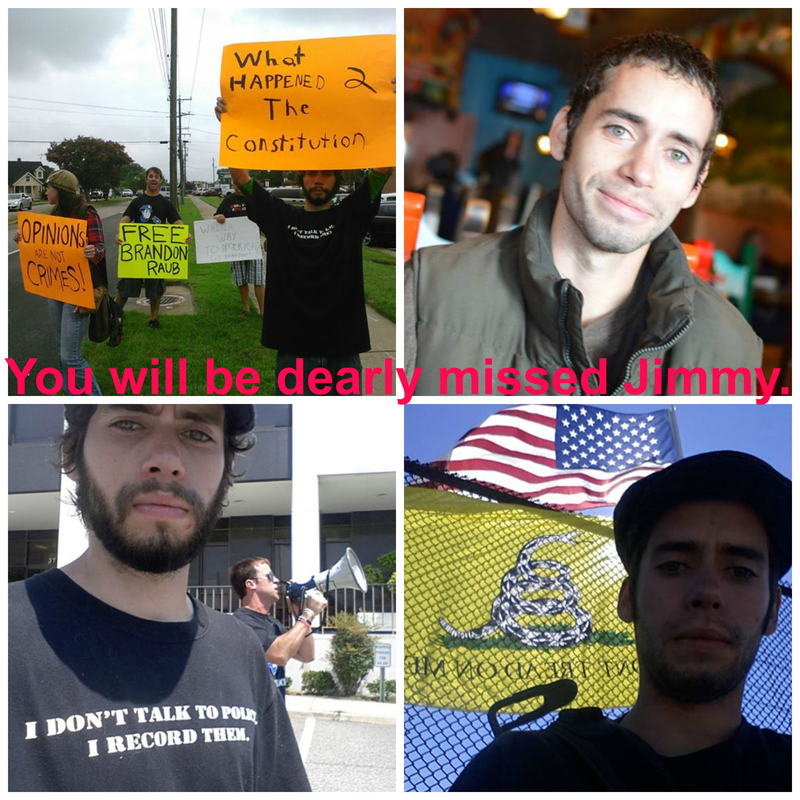 Today (March 20, 2015) at around 7am, Jimmy Higgins along with 3 other Richmond area men and activists were killed in a horrific car accident in Ohio, as they traveled to Michigan for some sort of event or demonstration. The three other men were Jason Spitzer III, Stephen Kim and David Armstrong, all of whom had made local Richmond news multiple times last year for their peaceful open-carry demonstrations, which were to encourage people to utilize their 2nd Amendment Rights to effectively protect themselves and not rely on other people for their security. I also had the pleasure of meeting and talking to Jason, Stephen and David at several events – solid, smart, caring and seemed very genuine, much like Jimmy. Maybe you disagree with their politics, but putting that aside these 4 men were truly outstanding individuals and I can confidently say that because I personally knew Jimmy and I am witnessing what friends are saying about Jason, David and Stephen on their respective Facebook Pages and on the status I posted when I heard the news. Great men seem to be a commodity in the wind these days and these men will never be forgotten and always be remembered as great men who stood up for their rights and the rights of others. As for Jimmy, If I recall correctly, I first met Jimmy back in 2012 and it may have been around the time that Brandon Raub was wrongfully detained, because he was at several of the demonstrations we organized in Petersburg during that time frame. He and I connected very well and Jimmy was eager to get educated and get involved. Jimmy was a tremendous help with Virginia Cop Block’s Liberty Empowerment Project, as we distributed 9,000+ informational “Know Your Rights” packets, door to door/ person to person in more than a dozen Richmond housing projects. It was during this time period when I really got to know Jimmy. This was later in the summer of 2012. Jimmy was a bright, genuine, determined young man. He was the same age as my little brother. Just 2 days from now, March 22nd, Jimmy would’ve turned 25. Jimmy leaves behind a mother, father, two brothers and two sisters. But He’d tell you he has 4 brothers and 4 sisters, because each of his siblings is married and he doesn’t refer to them as inlaws, but brothers and sisters. That’s the type of family oriented person he was. From what I know about Jimmy, he loved animals, loved nature, was a very family oriented person and loved to help people, which is why he got so involved with Virginia Cop Block. Jimmy had his own first and second hand encounters with police that apparently were questionable/ concerning enough to self-educate about his rights and ended up finding Virginia Cop Block and aspired to help make a difference – and that is exactly what he did. Jimmy was in the habit of sacrificing his time and even money some times to people in need and would give you the shirt off his back, if you needed it. Jimmy was a hard-working employee at Food Lion and would do anything to help his friends &/or family. My heart is breaking as I sit here in disbelief. After Jimmy was a tremendous help with the Liberty Empowerment Project he continued to stay involved. Jimmy was PIVOTAL in 2014 and even thus far in 2015. In 2014 a Petersburg teenager was brutally assaulted by a police officer for simply recording a traffic stop from a safe distance on private property. Jimmy played a huge roll in helping that young man Devin Thomas. He was the co-organizer for the demonstration we organized and offered any help/ assistance he could to Mr. Thomas during his legal matters. I know he’s played a pivotal roll also in educating the circle of friends he has in his Colonial Heights/ Peterburg area, educating them about non-violence & their individual rights. Just recently Jimmy played a KEY role in helping out a New Hampshire business owner and also activist who just happened to be passing through traveling to Georgia to briefly reunite with his family, when he was pulled over by Hopewell Sheriff’s Department and ended up being placed under arrest. Jimmy played a pivotal roll in coordinating with that man’s friends and helping him Bond out of Jail the following day of the arrest. Jimmy had recently received his Private Investigating certificate and was eager to generate some business and also help some people out. This is only a mere glimpse of who Jimmy is and what he was about. I encourage any friends or family to share your thoughts about Jimmy in the comment section below. Jimmy reminded me of my self. He was very down to earth. Very genuine, caring and selfless. Only a minority of people are willing to stand up and fight for a cause and he was apart of that minority. I hope the example that Jimmy set for his peers will resonate within them and replicate the great qualities and characteristics of Jimmy. I am organizing a vigil for Jimmy that will take place one day after his birthday, This coming Monday March 23rd at 5pm at White Bank Park in Colonial Heights which is a park Jimmy frequently took his dogs to. You can find Details on the Facebook Event here. We are raising money to help the family of James “Jimmy” Higgins with any and all costs associated with his funeral and memorial services. This is an extreme hardship for the family and we really want to show them how much Jimmy was loved and appreciated by helping remove this financial worry during their time of mourning. We sincerely appreciate your generous donation. Jimmy’s life was tragically ended on the morning of March 20th, 2015 along with 3 others when the vehicle he was in collided, head on, with a tractor trailer. Jimmy was a life long supporter of liberty and the second amendment and was at the time traveling to participate in a second amendment event. Jimmy was also very involved in the cause for police and judicial system accountability and transparency. Over the last 3 years he has helped educate literally more than 9 thousand people including his local friends in Colonial Heights and was very involved and active in his community. Jimmy was a well loved and respected member of the liberty community and society as a whole. Jimmy will be missed. Here are 2 videos that Jimmy recorded while interacting with the police.